Last night I sat down to watch ‘Anselm Kiefer/ Imagining the Future’, part of the ‘Imagine’ series for the BBC. 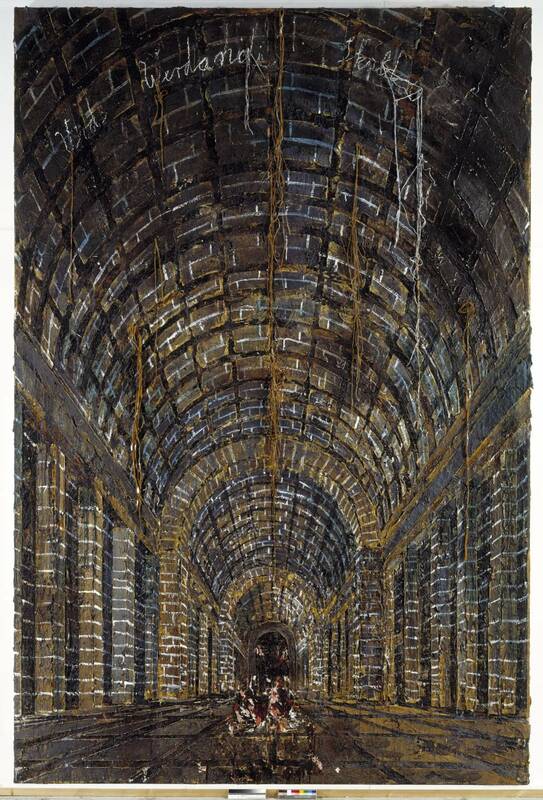 I knew a little about Kiefer’s work and have discussed him in brief with students over the past few years. However, the programme brought home to me the sheer ferocity of one man’s creative spirit. Painter, sculptor and installation artist, Kiefer has filled his world with paintings like churches, caves, caverns and tunnels deep beneath green French fields; life-size planes crashing into fields of dead sunflowers and swimming pools filled with mysterious floating continents. A Kiefer painting for me is rather like a patch of land. He adds and adds to its surface, encrusting it with paint, dirt, sand, lead, scrap metal, ash, straw and clay; then he takes away, digging back into it as if he were uncovering the past and the traces left behind by time and experience. Sometimes I feel my own creative energy inside myself – sometimes it feels like it won’t fit and it’s uncomfortable and I have to find ways to disperse it – it has to fit around my life, my life shapes it. As I was watching, my little boy H escaped from bed. He asked me what the programme was about. I told him it was about an artist just like him and he cuddled closer to watch. I told him the gentlemen we were watching was like him too in that he is unable to stop making. Every day H brings home from school bags of paper filled with drawings and sculptures, visual representations of the stories going off like fireworks in his head. I posed him the question that in 65 years’ time would he like Kiefer, still unable to stop? Would H’s creativity continue as a force to shape his life, would his life shape it or would it melt away like his childhood? The Kiefer film left me in awe, it left me quiet and thoughtful, but mostly it left me reassured. Our creativity, however it manifests itself, is a force just like gravity. When it moves inside me, it’s OK: there is nothing to fear.